Lebanese bassist and vocalist Donna Khalife is an accomplished and prize winning musician. A child prodigy she received a premier education both in Lebanon and France and has forged lasting relations with musicians from both countries. 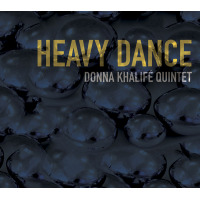 Her quintet's debut release, Heavy Dance, is a testament to her multi-pronged talent as it showcases Khalife leading the band through a series of intriguing original compositions and improvisations. The various pieces do not abide by a single motif and often evolve and transform with a dramatic flair. The engaging "Ri mineur" opens with a wistful touch as saxophonist Philippe Lopes de Sa mirrors, with his evocative phrases, Khalife's rich voice and agile song and the deep woody tones of the contrabass. Khalife's own bass reverberations, and electric bassist Florent Corbou's muscular strings together with guitarist Pierre Tereygeol's complex lines frame the haunting sax, vocal duet. Drummer Khaled Yassine propels the music forward with his crisp, brief bursts of thunderous beats. The mood becomes more expectant with Corbou soloing over atmospheric, punctuating percussion, leading to Lopes de Sa's lyrical soliloquy. Seamlessly the group interplay becomes passionate with a rock-inspired sound. Lopes de Sa blows fiery refrains as his colleagues lay down riotous and energetic rhythmic flourishes. Not all the tracks are as intricately constructed. Some of the shorter ones are powerful collective extemporizations that pack an intellectual and emotive punch. The mystical "Hope?" for instance features Khalife's ethereal wordless singing soaring with Lopes de Sa's melodic moan over a haunting string drone and Yassine's carefully timed thuds and thrums. Tereygeol takes centerstage with his introspective monologue that complements Lopes de Sa's pensive musings. Within its brief duration "Hope?" stirs and provokes. Khalife channels, throughout the album and within individual tunes, her various influences. The memorable and stimulating "International Unity" is simultaneously soulful and surreal. Lopes de Sa's twittering sax underscores the eloquence of Khalife's enunciation and the compelling poetry of the lyrics. Tereygeol introduces a funky swagger with his wah wah effects and Corbou enhances it with his erudite and conversational vamps. Khalife sings with facility and fluidly over the ensemble's delightfully dissonant, cinematic performance. Heavy Dance is an intelligent work that crackles with spontaneity and creative fervor. It is an auspicious start to Khalife's recording career and it demonstrates her brilliant and versatile artistry. Track Listing: Opening; Ri mineur; Mendoza; Belmonte; Hope? ; International Unity; Heavy Dance; The first and last collage; Koestlich; Karakol. Personnel: Donna Khalife: vocals and double bass; Pierre Tereygeol: guitar; Philippe Lopes de Sa: saxophones; Florent Corbou: electric bass; Khaled Yassine: drums.